The following is a Letter to the Editor which I wrote that was published on March 11, 2015, in Our Town, a local newspaper in Rockland County, New York. There’s a scene in the film Dead Poet’s Society, set in 1959, where Robin William’s character Mr. Keating asks his students to read from the introduction of a poetry textbook. The text describes a rating method by which one can measure and assess the greatness of poems. After charting and rating a poem on the blackboard Keating tells his students this method of assessing poetry is “excrement.” Next he instructs them to rip the entire introduction out, which they proceed to do, putting the pages into a trash can. The film goes on to show how the students learn to express themselves creatively, to experience life more deeply as they come to appreciate how their lives are like verses of poetry. Both Williams and his character Keating encouraged all of us to live as poets, with gratitude and passion, to cherish the beauty of life, to appreciate our own uniqueness, and not to measure, rank or compare ourselves with others. It’s an important life lesson, which unfortunately the architects of 21st Century school reform either do not seem to understand, or do not care about. Since 2001, when George Bush’s “No Child Left Behind” policies were put into motion, we’ve experienced a nation-wide obsession with assessment, ranking, testing, measuring, and quantifying both students’ learning and teachers’ teaching. Teaching to the test and test preparation have become a national priority; while art, poetry, music, sports, creative projects, students inner lives and the professional expertise of teachers have not. Obama had sought advice from Dr. Linda Darling-Hammond, a Stanford University researcher, with expertise and knowledge of innovative learner-centered practices and school reforms. With Darling-Hammond as his primary education advisor, Obama’s message was finely tuned, and in the 2008 election he was able to get the full support of America’s teachers. What educators did not realize at that time, was that whispering in his ear was Obama’s advisor Rahm Emanuel, who’s many Wall Street connections included a group of hedge fund investors running a campaign financing organization called Democrats for Education Reform (DFER). They were using President Obama as a kind of Trojan horse, with a hidden agenda, more in line with President Bush’s administration than with America’s teachers unions. Their goal was to ride into power in the shadow’s of Obama’s wings, so that they could take control of the U.S. Department of Education, and then enact even more regressive policies than Bush had been able to set in place, as part of the program Race to the Top (RTTT). 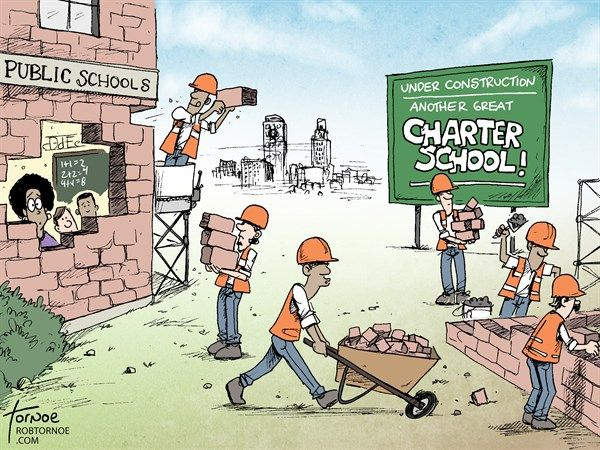 Once in power they would set in place policies that used “rigorous” standards, high-stakes tests, teacher assessments and other punitive practices to take away teachers’ local autonomy and power, and reduce the number of public schools in America, while enlarging the role of centralized testing companies and increasing the opportunities for charter schools to make a profit. After (or perhaps before) Obama was elected his Wall Street connected advisors convinced him to “throw” education expert Linda Darling-Hammond “under the bus,” as radio journalist Dr. James Miller put it, placing a non-educator charter school supporter named Arne Duncan into the top position of the Dept. of Education. Duncan had aggressively supported punitive measures, public school closings, standardized testing and charter school expansion in Chicago. He is connected to a billionaire “venture philanthropist” named Eli Broad, who had created a “leadership” training school called the Broad Academy, that exists outside of education. Over the last decade Broad has been able to put hundreds of pro-testing, pro-charter graduates in leadership positions as superintendents, education department staff and charter school principals across the nation. By doing so they were able to take control of state and district public school systems, implementing policy changes rooted in greater testing, ranking, assessment, school closings and other policies that would increase the flow of public tax funds into the pockets of testing service companies and charter schools’ private investors. Once in power, Duncan also teamed up with Microsoft’s Bill Gates, working with an organization called Achieve to create the Common Core standards by which all the children in America could be assessed, measured, ranked and compared to one another. These standards, amazingly enough, were not based on current research or innovative and successful practices in education, but instead re-booted a method of teaching from the Cold War era called “New Criticism,” favored by David Coleman – the so-called “architect” of Common Core. In states, Republican and Democratic governors such as New York’s Andrew Cuomo & Florida’s Jeb Bush, have lined up with the President’s objectives emphasizing testing, data collection and punitive assessments as well. Cuomo recently asking that student test scores count for 50% of a teachers assessment score and that the rest of the score be determined by outside observers, not the school principal. There are at least two major problems with these policies. First, with their jobs on the line, teachers are pressured to cut the arts and other meaningful activities to focus instead on test preparation and practice. Second, most professional researchers who study these teacher evaluation methods that state governments are using have said they are not reliable or valid tools of assessment. They don’t really measure what they were designed to measure. According to Dr. Edward Haertal, a leading psychometrician, careful analysis of the data has shown that individual teachers have only a small influence on student test scores, that there are many other factors such as family, poverty and peer pressure. In other words, if we take three teachers and rotate them among three schools differing by poverty, safety, financial resources and community/family support, the scores of students will be more related to the school situation then which teacher they have. Rich children with parents who are professionals and go to schools that have more funding will perform much better on standardized tests than poor kids whose parents are working class or unemployed. Value-added assessments linked to student test scores, that rank and punish teachers, are not reliable or valid instruments. They do not measure what the president, secretary of education, governors and their financial backers claim they measure. This is a critical flaw (possibly even an intentional act of fraud) with current reform policies, which place more importance on questionable data collection and punitive measurements then on the professional expertise of educators, whose understanding is grounded in decades of slow and careful research, with peer reviewed studies. The goal of educational research is to give us a deeper understanding of the complex factors impacting on students’ lives and learning. To ignore such knowledge, when it exists, could be regarded as an act of negligence. The Obama administration and their wealthy corporate supporters want to measure teachers and students, to apply scientific methods in potentially destructive and inappropriate ways. When this is done in the field of medicine it is called malpractice. Teaching is an art form rooted in the wise and careful use of educational research and assessment tools. Teachers give tests, but they are trained to assess carefully, much as doctors and nurses learn to use care with needles and surgical knives. When government policy makers continue to implement evaluation methods and tools criticized by education professionals they are embarking on a very dangerous nation-wide experiment. Focusing their attention on data collection and high-stakes testing creates the illusion of knowledge and control. It allows people who lack understanding to assert that they have it, when in fact what they are actually putting in place is more like a marketing strategy designed to intentionally bypass the truth. They are misusing scientific measures, ignoring what is actually most important and meaningful, measuring what is not easily quantifiable with numbers. In order to do this successfully, our nation’s leaders and their wealthy supporters made a conscious decision to ignore the complaints and criticism of America’s education professionals. They are manufacturing and cherry picking data that supports their agenda, ignoring the rest. “We cannot ignore facts,” the President said, and yet that is exactly what they have done, betraying teachers, parents and students. Betraying the lives and futures of the very people that helped get the President elected. About myself: I’m a 1979 graduate of Clarkstown South High School, in Rockland County, New York. I majored in studio art at SUNY, Oneonta, graduating in 1983. From 1988 to 1993, I worked on my doctoral degree in Child & Adolescent Development at Stanford University’s School of Education. During that time I worked for about 3 years as a research assistant with the Accelerated Schools Project. After graduating from Stanford in 1993, I moved to Japan, where I have been teaching English language and culture at Seinan Gakuin University, in Fukuoka, Japan. This entry was posted in education reform and tagged education reform, school reform. Bookmark the permalink. Thanks for all you guys have been doing! Thank you so much for this. I am a teacher of children in poverty and a mother of a Gifted student-in Florida- who had the creativity beat out of him by the NCLB policies. I plan you share your post widely.